Dual Drivers and Echo Processing Technology offering impressive bass and allowing you enjoying a clear sound experience. 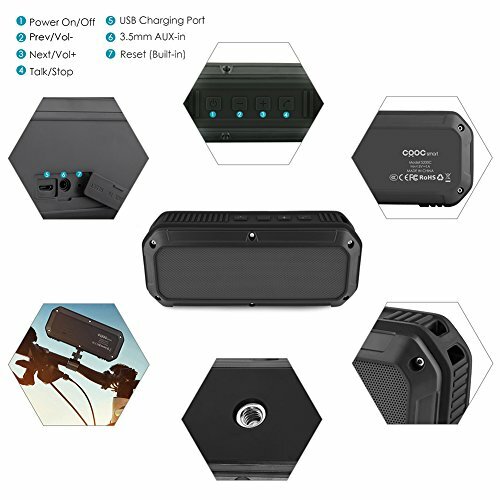 It is perfect for camping, pool parties or other outdoors activities.it can as an emergency power supply when you are Outdoors. Also,it is suitable for quiet activities like reading, taking a nice bath or doing yoga when you need relaxing music. Easy to reach physical buttons and connectors provide accessible function control for power ON/OFF, Playback control, volume control, Bluetooth pairing, micro USB charging, and aux-in functions with minimalist fuss. Conspicuous blue/red LED indicator highlights connecting and charging status for easy confirmation. You will be greeted with an incoming call announcement. If you’re relaxing in the bath or having a dip in the pool and are too wet to answering the phone, the built-in MIC will allow you to chat without wetting your phone. -Rated IP64 can resist water spray;You should make sure that charging port plastic lid are tight close it,Do not let it being fully immersed in water. 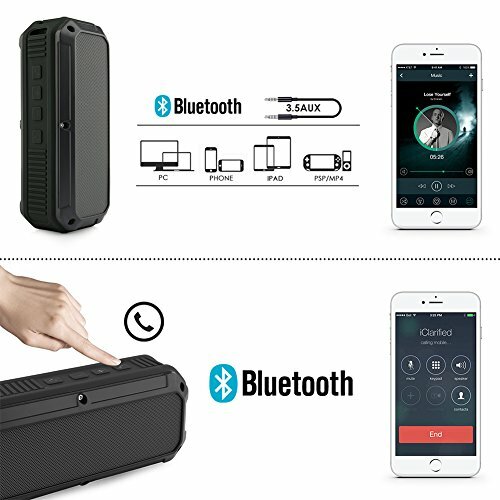 -The speaker can not connect two devices at the same time,just one. 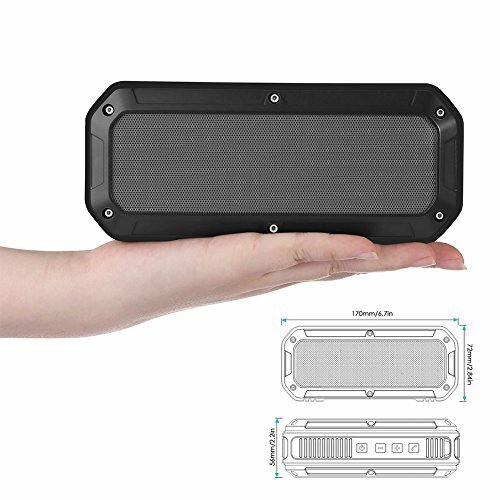 ADVANCED DUAL 2*3W SPEAKER : Implemented With 2*3W loudspeaker in the little device which can produce a loud, clear and high qualify sounds.Perfect for travel, bicycle/Bike, cycling, climbing, camping, hiking, running, fishing etc outdoor sports use. 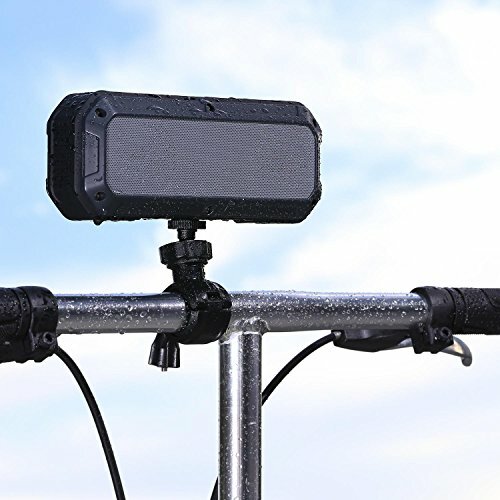 WATERPROOF,SHOCKPROOF,DUSTPROOF : Durable Shell Rated IP64 for resistance against dust and water, meaning the Speaker can withstand pressurized jets and waves of water. Unique shell material avoid scratching and anti-shockproof(test passed within 1 meter),Can be used under harsh environment. 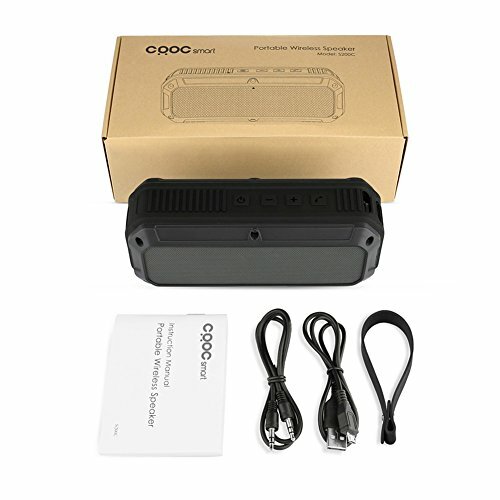 AUTOMATICAL RECONNECTION & EASY PAIR : Comes with an amazing bluetooth quality that is easy and simple, and always pairs after the first pairing! It will automatically connect to the last connected smart device when you open ,You don’t ever have re-pair them again. Up to 33 feet connect range without losing quality or transmission of your music! . Built in high sensitivity MIC, 3.5mm Audio in Jack mode for computer or other non-bluetooth devices. LONG BATTERY LIFE & AUTOMATIC SHUT-DOWN : Built-in rechargeable 2600mAh lithium battery , For up to 13 hours of playtime at medium volume, up to 10 hours playing time at the maximum volume. 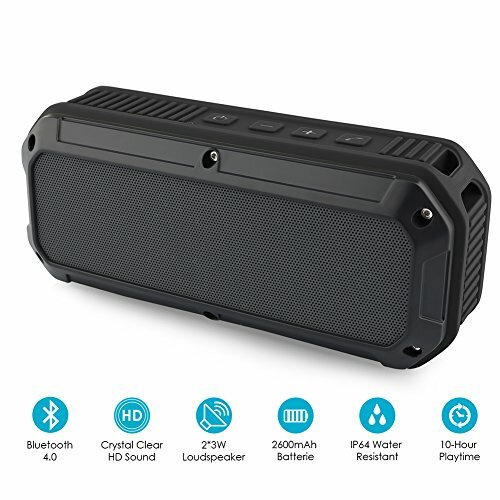 and if you not connect with our speaker ,it will Automatic shut-down in 20 Minutes ,So you don’t worry your speaker always in the boot state when you not use it, Perfect for an all day outing. And Have battery residual quantity indicator function. 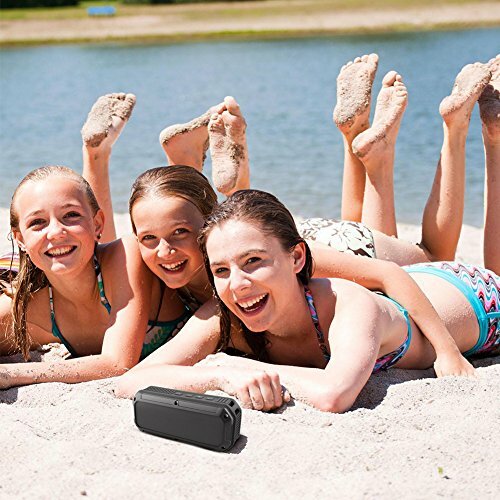 UNIVERSAL COMPATIBILITY : Our portable speakers can be paired with all types of devices that use Bluetooth technology! 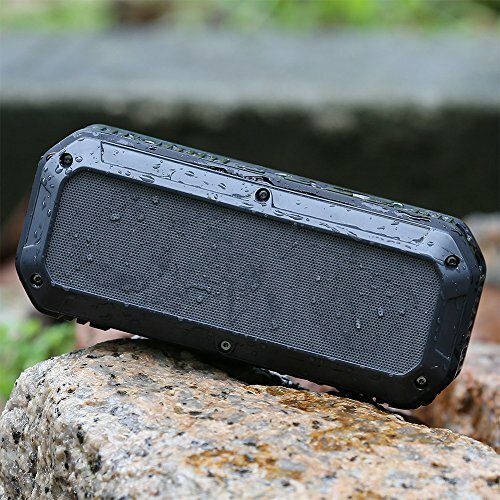 Use the water-resistant Bluetooth speaker to stream music from an iPhone or Android smartphone, an iPad or Android tablet, an iPod Touch or even a computer or laptop with Bluetooth.